To Cite: Abbasi Shaye M, Sharifmoghadam M R, Bahreini M, Ghazvini K, Mafinezhad A, et al. Study of the Role of Efflux Pumps in Amikacin-Resistant Acinetobacter Isolates from Teaching Hospitals of Mashhad, Iran, Jundishapur J Microbiol. 2018 ; 11(4):e12754. doi: 10.5812/jjm.12754. Background: The development of multidrug-resistant Acinetobacter species has created serious problems in nosocomial infections. Understanding the underlying resistance mechanisms and their significance in conferring resistance to different antibiotics is the first step to develop strategies for fighting or reversing the current resistance. Objectives: The aim of this study was to investigate the role of efflux pumps in decreasing susceptibility to amikacin in Acinetobacter clinical isolates. Methods: Forty-six clinical Acinetobacter isolates were collected from 2 teaching hospitals of Mashhad, Iran. Susceptibility testing was conducted by the disc diffusion method. Amikacin minimum inhibitory concentration (MIC) for resistant Acinetobacter isolates was determined according to the Clinical and Laboratory Standards Institute (CLSI) guidelines either with or without the efflux pumps inhibitor, carbonyl cyanide 3-chlorophenylhydrazone (CCCP). Conventional polymerase chain reaction (PCR) was used to analyze the presence of pump genes. Results: Acinetobacter isolates were identified as 2 species; Acinetobacter baumannii and A. lwoffii. Susceptibility testing showed high levels of resistance to amikacin in 27 isolates, including both A. baumannii and A. lwoffii, among which 20 A. baumannii isolates showed a 2- to 524288-fold reduction in amikacin MIC in the presence of CCCP, while no reduction occurred in amikacin MIC in resistant A. lwoffii isolates. The PCR results showed high frequencies of adeB, abeM, and adeI genes in Acinetobacter isolates yet the adeE gene was not found in any of the isolates. Conclusions: The obtained results indicated the importance of efflux pumps in conferring resistance to amikacin in clinical isolates of A.baumannii, yet not in A. lwoffii. The emergence and rapid spread of multidrug resistant (MDR) and pan-drug resistant (PDR) Acinetobacter strains causing nosocomial infections, are of global importance (1, 2). In general, the most important mechanisms of resistance in Gram negative pathogens are producing beta-lactamases and aminoglycoside modifying enzymes, reduction in the expression of outer membrane proteins, mutations in topoisomerases, and overexpression of efflux pumps. Unfortunately, combination of several resistance mechanisms leads to the development of MDR and even PDR strains (3). Efflux pumps exist in all living cells and protect them against toxic effects of organic chemical compounds. These pumps actively eject structurally unrelated substrates, including antimicrobial of different classes, and cause the MDR phenotype. Bacterial multi-drug resistance is often associated with overexpression of efflux pumps that reduces drug accumulation inside the bacterial cell, resulting in an increase in the minimum inhibitory concentration (MIC). Efflux pumps consist of 3 components, the inner membrane transporter, the outer membrane channel, and the periplasmic lipoprotein. Multidrug efflux pumps are generally encoded on the chromosome, and their overexpression is often associated with mutations in regulatory genes. However, drug-specific efflux pumps are encoded by mobile genetic elements and their acquisition is enough for conferring resistance (4). Multi-drug efflux systems are divided to 5 families (5), including ATP-Binding cassette transporters (ABC), major facilitator superfamily (MFS), resistance-nodulation- division (RND), multidrug and toxic compound extrusion (MATE), and small multidrug resistance (SMR) based on structural homology, the number of subunits, the folding of the membrane, substrate specificity and energy source. Among all the efflux systems, the RND family is the most frequent in Gram negative bacteria. Efflux-mediated resistance is important for 2 main reasons: In all metabolic processes, there is a high degree of specificity of enzyme activity and protein transport, while the efflux pumps identify a wide range of substrates with different chemical and structural characteristics and export them out of the bacterial cell (5). In addition, they allow bacteria to survive under stress conditions and increase the time of antibiotic exposure by delaying the death of bacteria, thus the chance of mutations, in order to earn higher levels of resistance (6, 7). At first, antibiotic resistance associated with efflux pumps was limited to hydrophobic and amphiphilic compounds, such as quinolones, ampicillin, tetracycline, macrolides, beta-lactams, chloramphenicol, and rifampin (8). However, recently a few multidrug efflux systems have been reported as the active mechanisms of resistance to aminoglycosides in Gram-negative bacteria, such as (9) Burkholderia pseudomallei, Pseudomonas aeruginosa (10, 11), Acinetobacter baumannii (12), and Escherichia coli (13). AdeABC, an RND-type efflux pump, is reported to be associated with aminoglycoside resistance, as well as many other antibiotics (12). Overexpression of other RND-type efflux pumps, like AdeFGH and AdeIJK, also play a role in multidrug resistance in A. baumannii. A MATE family pump, AbeM, has also been reported to be involved in the multidrug resistance phenotype (14). The aim of this study was to further characterize the role of efflux pump in amikacin resistance in Acinetobacter isolates. The ethics committee of Ferdowsi University of Mashhad approved the design and protocol of the study. The University ethics committee code number was IR.MUM.FUM.REC.1396.09. Names and characters, personal information and patients’ illnesses and their medical information remained secret. One hundred and thirty Gram negative bacilli were isolated from hospitalized patients at Shahid Kamyab and Ghaem hospitals in Mashhad, Iran from December 2014 to August 2015 (culture media were purchased from Merck, Germany). Bacterial identification was carried out by standard biochemical tests (Microgen GNA kit, United Kingdom) and Acinetobacter isolates were selected for further investigation. Susceptibilities to antimicrobial agents were determined for all Acinetobacter isolates using the disk diffusion (Kirby-Bauer) test according to clinical and laboratory standards institute (CLSI) protocol (15). Antibiotics used in disk diffusion tests, included ampicillin, amikacin, imipenem, ceftriaxone, ciprofloxacin, polymyxin B, carbenicillin, gentamicin, ceftazidime, cefotaxime, tobramycin, tetracyclines, piperacillin, amoxyclav, and amoxicillin (HiMedia, India). Amikacin MIC was determined in the range of 4 to 4096 µg/mL for all amikacin-resistant Acinetobacter isolates. Determination of amikacin MIC was repeated in the presence of efflux pumps inhibitor, cyanide 3-chlorophenylhydrazone (CCCP) (Sigma Aldrich, USA), in order to investigate the role of efflux pumps in amikacin resistant isolates. To determine the appropriate concentration of CCCP in combination with amikacin (Sigma Aldrich, USA), an MIC determination of CCCP was also carried out and a concentration equal to 1/2 and 1/4 of the determined MIC was used as the non-inhibitory concentration. Determination of MIC values was carried out using the broth microdilution method in 96-well micro plates, according to CLSI standards (15). Distribution of efflux genes adeB, adeE, adeI, and abeM was investigated in all Acinetobacter isolates by the Polymerase Chain Reaction (PCR) directly from bacterial colonies using taq DNA polymerase master mix (Ampliqon, Denmark). The PCR conditions were as follows: Initial denaturation at 95°C for 5 minute, 30 cycles with denaturation at 94°C for 1 minute, 30 seconds annealing at 51°C for adeB and abeM genes, 45 seconds at 53.5°C and 51.5°C for adeI gene and adeE gene, respectively, extension at 72°C for 45 seconds, followed by final extension at 72°C for 10 minutes (Biorad, Germany). Primer pairs (Microgen, South Korea) for adeB, adeI, abeM, and adeE genes amplification are shown in Box 1. Out of 130 isolates, a total number of 46 Acinetobacter isolates were identified, 33 isolates (71.7%) identified as A. baumannii and 13 isolates (28.3%) as A. lwoffii. Acinetobacter samples were isolated from throat (6 isolates), lungs (3 isolates), bronchi (4 isolates), trachea (3 isolates), mucus (1 isolate), general secretions (11 isolates), ascites (2 isolates), bone (1 isolate), urinary (2 isolates), and wound (13 isolates) sources from hospitalized patients in internal medicine (4 isolates), surgery (5 isolates), intensive care unit (23 isolates), and orthopedic (14 isolates) wards of Ghaem (14 isolates) and Shahid Kamyab (32 isolates) hospitals. The pattern of antibiotic resistance in Acinetobacter isolates is shown in Table 1. All the isolates were multidrug resistant and showed resistance to most tested antibiotics. The highest degree of resistance (100%) was observed against amoxicillin and tetracycline. The least degree of resistance was observed against polymyxin B (10.86%) and amikacin (58.69%). Out of 46 Acinetobacter isolates, 27 isolates were resistant to amikacin. Abbreviations: AK, Amikacin; AMC, Amoxyclav; AMP, Ampicillin:; AMX, Amoxicillin; CAZ, Ceftazidime; CB, Carbenicillin; CFM, Cefixime; CIP, Ciprofloxacin; CTR, Ceftriaxone; CTX, Cefotaxime; GEN, Gentamicin; IPM, Imipenem; PB, Polymyxin B; PI, Piperacillin; TE, Tetracycline; TOB, Tobramycin. Determination of CCCP MIC was conducted for each of the amikacin-resistant Acinetobacter isolates. It ranged from 1.56 to 50 µg/mL among 27 Acinetobacter isolates, which was 25 to 50 µg/mL in most cases (20 isolates). Amikacin MIC determination in each of the 27 amikacin resistant isolates was also carried out alone and in the presence of CCCP. In all amikacin-resistant bacteria, a high level of resistance to amikacin (1024 to 4096 µg/mL) was observed. Out of 27 amikacin-resistant Acinetobacter isolates, 23 isolates (85.2% of resistant isolates) were identified as A. baumannii and 4 isolates (14.8%) were identified as A. lwoffii, among which 20 A. baumannii isolates, yet no A.lwoffii isolates, showed a 2- to 524288-fold reduction in amikacin MIC in the presence of CCCP, indicating the involvement of efflux pumps in resistance to amikacin. Table 2 shows amikacin MIC values of resistant isolates in the presence and absence of 2 different CCCP concentrations. aCCCP (1/2), a concentration of CCCP equals to one half of its MIC determined for the specific isolate; CCCP (1/4), a concentration of CCCP equals to a quarter of its MIC determined for the specific isolate. bIsolates with mild reduction in amikacin MIC in the presence of CCCP. cIsolates with high levels of reduction in amikacin MIC in the presence of CCCP. dIsolates with extreme levels of reduction in amikacin MIC in the presence of CCCP. The adeB, abeM, and adeI genes were observed in 36 (78.26%), 37 (80.43%), and 36 (78.26%) Acinetobacter isolates, respectively, while adeE gene was not found in any of the isolates (0%). Figure 1 shows the PCR amplification of the genes in some Acinetobacter isolates. Table 3 shows the genetic patterns observed in Acinetobacter isolates. A, 100 base pair (bp) DNA Ladder, 1 - 13 Products of PCR, Lower bonds show the amplification of adeB gene (541 bp) and upper bonds show the amplification of abeM gene (703bp). 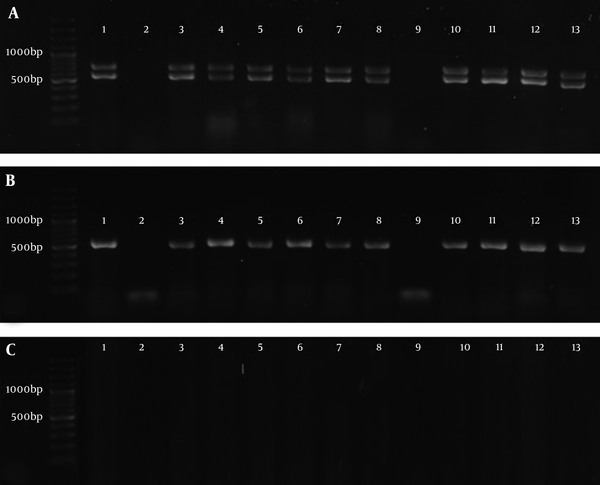 B, 100 bp DNA Ladder, 1 - 13 Products of PCR of adeI gene (541 bp). C, 100 bp DNA Ladder, amplification of adeE gene did not happen (expected size: 504 bp). Among 20 A. baumannii isolates, which showed a decreased MIC in presence of CCCP, the AdeI gene was found in 19 isolates and adeB and abeM genes were found in all isolates. Among A. lwoffii isolates, 3 isolates contained all 3 genes at the same time, 7 isolates contained none of the mentioned genes, and the rest contained 1 of the adeB, abeM or adeI genes. The aim of present study was to investigate the role of efflux pumps in amikacin resistance in Acinetobacter isolates. The results of the identification of Acinetobacter species confirmed both the importance of A. baumannii in nosocomial infections, which is the center of attention in many researches all around the world (16, 17), and also highlighted the significance of A. lwoffii in the same topic, which was neglected by the studies of resistance patterns and mechanisms. In a study by Constantiniu et al. in 2004 on 24 isolates of Acinetobacter, 12 environmental and 12 clinical samples, 3 clinical isolates (25%) and 4 environmental isolates (33.33%) were identified as A. lwoffii and the rest were identified as A. baumannii species (18). In the present study, A. lwoffii isolates showed almost the same proportion (28.3%) among clinical samples. In the presence of CCCP, a reduction of 2 to 524288 folds in amikacin MIC was observed in 74.07% of resistant isolates. The decline rate of 8 and 2 times in amikacin MIC in Acinetobacter was reported by Magnet et al. (12) and Nikasa et al. (19) respectively. Ardebili et al. reported 2 to 64 folds of reduction in ciprofloxacin MIC in 86.1% of Acinetobacter isolates (20). In this study, among 20 A. baumannii isolates, which showed a reduction in amikacin MIC in the presence of CCCP, 10 isolates (50%) showed a mild reduction (2 to 8 folds), 5 isolates (25%) showed high levels of reduction (16 to 128 folds), and extreme reduction (256 to 524288 fold) was observed in 5 isolates (25%). According to CLSI standards (15), amikacin MIC value of less or equal to 16 µg/mL (16 µg/mL ≥ MIC) in Acinetobacter species is considered as the range of sensitivity. If it is assumed that the conversion from resistant to a sensitive isolate after inhibiting efflux pumps activity, indicates the role of efflux pumps as the single mechanism responsible for the resistance, then the 5 A. baumannii isolates of this study, Ac19, Ac24, Ac25, Ac28 and Ac30, would be classified in such a group. These isolates included 18.52% of all amikacin resistant isolates. According to a study by Chau et al., adeE pump belonging to the RND family had the ability to export antibiotics, including aminoglycosides (21). The AdeE gene is often observed in Acinetobacter GDG3 and does not coexist with adeABC efflux pump, according to the study by Lin et al. (22). The results of the present study on the adeE gene showed no evidence of this gene in A. baumannii and A. lwoffii. Magnet et al. (12) reported adeABC pump activity responsible for the resistance to aminoglycosides in Acinetobacter baumanniiBM4454. Bratu et al. also attributed the resistance to aminoglycosides and fluoroquinolones to the presence of this pump (23). Japoni Nejad et al. (24) as well as Gholami et al. (25) reported the presence of adeB gene in all of their studied A. baumannii isolates, which is very close to the results of the present study (97%). AbeM is an efflux pump belonging to the MATE family, which is involved in resistance to norfloxacin, ofloxacin, ciprofloxacin, gentamicin, doxorubicin, and triclosan, according to the research conducted by Su et al. (14). The presence of abeM gene in all 20 isolates with efflux-mediated resistance to amikacin in this study could be due to its contribution to amikacin resistance. Overexpression of AdeIJK pump could cause resistance to beta-lactams, chloramphenicol, tetracycline, erythromycin, fluoroquinolones, fusidic acid, novobiocin, and trimethoprim (26, 27). In a study by Yoon et al. (28), this gene was found in all clinical isolates without any increased expression. The PCR results in a study done by Kor et al. showed that 67.4% of A. baumannii isolates contained the adeA and adeI genes (29). However, in the present study, the adeB gene of adeABC pump coexists with adeI in 93.9% of A.baumannii isolates. It appears that the activity of these pumps, particularly in cooperation with each other could contribute to the resistance to amikacin in A. baumannii. Based on the results of this study, very high contribution of efflux pumps to amikacin resistance in A. baumannii isolates indicates the great importance of this mechanism in antibiotic resistance. It could rapidly spread among A.baumannii isolates, which is alarming and shows an urgent need for further research in order to design efflux pump inhibitors capable of simultaneous use with antibiotics in treatment. The authors thank the staff of the microbiology laboratories of Ghaem and Shahid Kamyab hospitals of Mashhad for their help with collecting the clinical isolates. Authors’ Contribution: Study concept and design, Mohammad Reza Sharifmoghadam; acquisition of data, Kiarash Ghazvini and Asghar Mafinezhad; analysis and interpretation of data, Maryam Abbasi Shaye and Ghazale Amiri; drafting of the manuscript, Maryam Abbasi Shaye; critical revision of the manuscript for important intellectual content, Mohammad Reza Sharifmoghadam; statistical analysis, Maryam Abbasi Shaye; administrative, technical, and material support, Mohammad Reza Sharifmoghadam, and Masoumeh Bahreini; study supervision, Mohammad Reza Sharifmoghadam. Financial Disclosure: All authors declare that they had no conflict of interest. Funding/Support: This study was funded by Ferdowsi University of Mashhad. 1. Abbo A, Navon-Venezia S, Hammer-Muntz O, Krichali T, Siegman-Igra Y, Carmeli Y. Multidrug-resistant Acinetobacter baumannii. Emerg Infect Dis. 2005;11(1):22-9. doi: 10.3201/eid1101.040001. [PubMed: 15705318]. 2. Jain R, Danziger LH. Multidrug-resistant Acinetobacter infections: an emerging challenge to clinicians. Ann Pharmacother. 2004;38(9):1449-59. doi: 10.1345/aph.1D592. [PubMed: 15280512]. 3. Bonomo RA, Szabo D. Mechanisms of multidrug resistance in Acinetobacter species and Pseudomonas aeruginosa. Clin Infect Dis. 2006;43 Suppl 2:S49-56. doi: 10.1086/504477. [PubMed: 16894515]. 4. Lin MF, Lin YY, Tu CC, Lan CY. Distribution of different efflux pump genes in clinical isolates of multidrug-resistant Acinetobacter baumannii and their correlation with antimicrobial resistance. J Microbiol Immunol Infect. 2017;50(2):224-31. doi: 10.1016/j.jmii.2015.04.004. [PubMed: 26055688]. 5. Poole K. Outer membranes and efflux: the path to multidrug resistance in Gram-negative bacteria. Curr Pharm Biotechnol. 2002;3(2):77-98. doi: 10.2174/1389201023378454. [PubMed: 12022261]. 6. Lomovskaya O, Watkins W. Inhibition of efflux pumps as a novel approach to combat drug resistance in bacteria. J Mol Microbiol Biotechnol. 2001;3(2):225-36. [PubMed: 11321578]. 7. Lomovskaya O, Bostian KA. Practical applications and feasibility of efflux pump inhibitors in the clinic--a vision for applied use. Biochem Pharmacol. 2006;71(7):910-8. doi: 10.1016/j.bcp.2005.12.008. [PubMed: 16427026]. 8. Nikaido H. Antibiotic resistance caused by gram-negative multidrug efflux pumps. Clin Infect Dis. 1998;27 Suppl 1:S32-41. doi: 10.1086/514920. [PubMed: 9710669]. 9. Moore RA, DeShazer D, Reckseidler S, Weissman A, Woods DE. Efflux-mediated aminoglycoside and macrolide resistance in Burkholderia pseudomallei. Antimicrob Agents Chemother. 1999;43(3):465-70. [PubMed: 10049252]. 10. Aires JR, Kohler T, Nikaido H, Plesiat P. Involvement of an active efflux system in the natural resistance of Pseudomonas aeruginosa to aminoglycosides. Antimicrob Agents Chemother. 1999;43(11):2624-8. [PubMed: 10543738]. 11. Westbrock-Wadman S, Sherman DR, Hickey MJ, Coulter SN, Zhu YQ, Warrener P, et al. Characterization of a Pseudomonas aeruginosa efflux pump contributing to aminoglycoside impermeability. Antimicrob Agents Chemother. 1999;43(12):2975-83. [PubMed: 10582892]. 12. Magnet S, Courvalin P, Lambert T. Resistance-nodulation-cell division-type efflux pump involved in aminoglycoside resistance in Acinetobacter baumannii strain BM4454. Antimicrob Agents Chemother. 2001;45(12):3375-80. doi: 10.1128/AAC.45.12.3375-3380.2001. [PubMed: 11709311]. 13. Rosenberg EY, Ma D, Nikaido H. AcrD of Escherichia coli is an aminoglycoside efflux pump. J Bacteriol. 2000;182(6):1754-6. [PubMed: 10692383]. 14. Su XZ, Chen J, Mizushima T, Kuroda T, Tsuchiya T. AbeM, an H+-coupled Acinetobacter baumannii multidrug efflux pump belonging to the MATE family of transporters. Antimicrob Agents Chemother. 2005;49(10):4362-4. doi: 10.1128/AAC.49.10.4362-4364.2005. [PubMed: 16189122]. 15. Clinical and Laboratory Standards Institute . Performance Standards for Antimicrobial Susceptibility Testing. Wayne, PA, USA: Clinical and Laboratory Standards Institute; 2014. 16. Neonakis I, Gikas A, Scoulica E, Manios A, Georgiladakis A, Tselentis Y. Evolution of aminoglycoside resistance phenotypes of four Gram-negative bacteria: an 8-year survey in a University Hospital in Greece. Int J Antimicrob Agents. 2003;22(5):526-31. doi: 10.1016/S0924-8579(03)00152-3. [PubMed: 14602373]. 17. Fihman V, Lartigue MF, Jacquier H, Meunier F, Schnepf N, Raskine L, et al. Appearance of aac(6')-Ib-cr gene among extended-spectrum beta-lactamase-producing Enterobacteriaceae in a French hospital. J Infect. 2008;56(6):454-9. doi: 10.1016/j.jinf.2008.03.010. [PubMed: 18440645]. 18. Constantiniu S, Romaniuc A, Iancu LS, Filimon R, Taraşi, I . Cultural and biochemical characteristics of Acinetobacter spp. strains isolated from hospital units. J Prevent Med. 2004;12(3-4):35-42. 19. Nikasa P, Abdi-Ali A, Rahmani-Badi A, Al-Hamad A. In vitro evaluation of proton motive force-dependent efflux pumps among multidrug resistant Acinetobacter baumannii isolated from patients at Tehran Hospitals. Jundishapur J Microbiol. 2013;6(7). doi: 10.5812/jjm.6792. 20. Ardebili A, Lari AR, Talebi M. Correlation of ciprofloxacin resistance with the AdeABC efflux system in Acinetobacter baumannii clinical isolates. Ann Lab Med. 2014;34(6):433-8. doi: 10.3343/alm.2014.34.6.433. [PubMed: 25368818]. 21. Chau SL, Chu YW, Houang ET. Novel resistance-nodulation-cell division efflux system AdeDE in Acinetobacter genomic DNA group 3. Antimicrob Agents Chemother. 2004;48(10):4054-5. doi: 10.1128/AAC.48.10.4054-4055.2004. [PubMed: 15388479]. 23. Bratu S, Landman D, Martin DA, Georgescu C, Quale J. Correlation of antimicrobial resistance with beta-lactamases, the OmpA-like porin, and efflux pumps in clinical isolates of Acinetobacter baumannii endemic to New York City. Antimicrob Agents Chemother. 2008;52(9):2999-3005. doi: 10.1128/AAC.01684-07. [PubMed: 18591275]. 24. Japoni Nejad AR, Sofian M, Ghaznavi-Rad E. Molecular detection of AdeABC efflux pump genes in clinical isolates of Acinetobacter baumannii and their contribution in imipenem resistance [In Persian]. Iran South Med J. 2014;17(5):815-23. 25. Gholami M, Hashemi A, Hakemi-Vala M, Goudarzi H, Hallajzadeh M. Efflux Pump Inhibitor Phenylalanine-Arginine Beta-Naphthylamide Effect on the Minimum Inhibitory Concentration of Imipenem in Acinetobacter baumannii Strains Isolated From Hospitalized Patients in Shahid Motahari Burn Hospital, Tehran, Iran. Jundishapur J Microbiol. 2015;8(10). e19048. doi: 10.5812/jjm.19048. [PubMed: 26568800]. 26. Damier-Piolle L, Magnet S, Bremont S, Lambert T, Courvalin P. AdeIJK, a resistance-nodulation-cell division pump effluxing multiple antibiotics in Acinetobacter baumannii. Antimicrob Agents Chemother. 2008;52(2):557-62. doi: 10.1128/AAC.00732-07. [PubMed: 18086852]. 27. Coyne S, Courvalin P, Perichon B. Efflux-mediated antibiotic resistance in Acinetobacter spp. Antimicrob Agents Chemother. 2011;55(3):947-53. doi: 10.1128/AAC.01388-10. [PubMed: 21173183]. 28. Yoon EJ, Courvalin P, Grillot-Courvalin C. RND-type efflux pumps in multidrug-resistant clinical isolates of Acinetobacter baumannii: major role for AdeABC overexpression and AdeRS mutations. Antimicrob Agents Chemother. 2013;57(7):2989-95. doi: 10.1128/AAC.02556-12. [PubMed: 23587960]. 29. Kor SB, Chew CH. Distribution of the multidrug efflux pump genes adeA, adeI, adeJ, adeY and integrons in clinical isolates of Acinetobacter baumannii from Malaysian hospitals. Biomed Res. 2014;25(2).